When I first laid eyes on today's canvas, I knew EXACTLY what I was going to do with the white flowers...and completely clueless as to what to do with the red flowers. Ten plus years later, I have no regrets and am more excited about the red flowers than the white flowers. The stitched sample used Neon Rays (black lines) and Fyre Werks (turquoise lines) on 13-mesh. A laying tool was essential in keeping the Neon Rays flat and smooth. It works, I promise. And it's easy. I really do love this stitch. It has straight and oblique stitches, leading to a really pretty symmetry. Technically, it's an open stitch, but really passes as a full coverage stitch. I recommend using this stitch for an area you want to draw attention to. Clearly, I like it for a flower. Other space ideas include clothing, an intriguing roof, or a dramatic bag. Ideas for thread combinations include Very Velvet (gray lines) and Fyre Werks (turquoise lines) for a jacket, Rainbow Linen (gray lines) and Lorikeet (turquoise lines) for a roof, or Soie D'Alger (gray lines) and Silk Lame (turquoise lines) for a bag. If you want more bling, swap the metallic and matte threads in any of the mentioned combos. 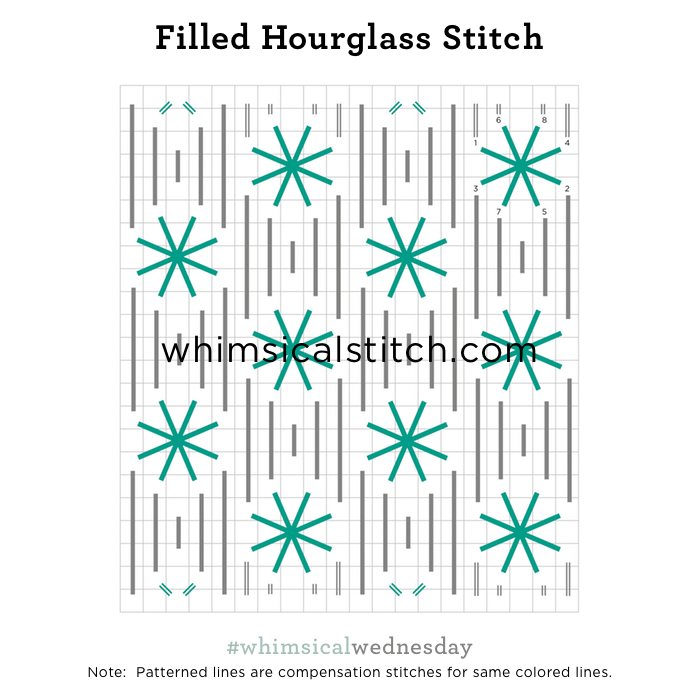 If you like what you see on this blog, want to learn some very creative decorative stitches, and how to put them all together, whimsicalstitch.com sells Stitch Guides and Stitch Concepts for Melissa Shirley Designs, Zecca Designs, and Patience Brewster. Click here to see the 20 newest guides and click here to see the entire collection.